Toyota is aiming for emission-free warehousing by 2020 with the development of its new western Sydney parts centre. In the last six months, the system has generated more than 330,000 kilowatt hours – enough electricity to power 75 four-person households, Toyota says. Other environmental features include rainwater tanks for irrigation and toilets, LED sensor lights, and a design with specific materials and building orientation that ensures maximum natural cooling. Further work will begin mid-2019 with an extension of the solar system. Toyota is also trialing the use of hydrogen powered fuel-cell forklifts on site, which it says is expected to be the first of its kind created by Toyota to be used outside of Japan. 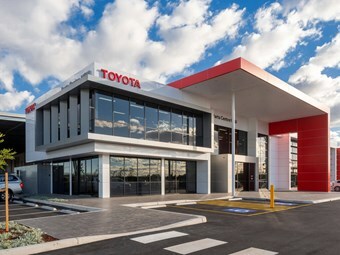 Toyota Australia president Matthew Callachor says plans for the new TPC's environmental credentials aligned with direct action globally – a possible slight against Australian government inaction. "Our commitment as a mobility company is to address environmental challenges that we face, as part of our contribution to an ever-better society," Callachor says. "One way we're doing that in Australia is embracing green building solutions for new and upgraded facilities, cutting CO2 emissions by adopting renewable energy sources such as solar and wind power, and by utilising alternative fuel sources such as hydrogen." "This goes hand-in-hand with our plans to increase the number of hybrid models in our range, as well as our advocacy of a hybrid society built upon clean and renewable energy technology. The warehousing arm aligns with Toyota’s vision for the vehicle market, adding it is aiming for every model to be available as either a dedicated electrified model or have an electrified option by around 2025, and for electrified vehicles to account for more than 50 per cent of its new-vehicle sales by the end of the next decade.